An "emotional" Gordon Strachan refused to be drawn on whether he wishes to remain as Scotland manager for the 2018 World Cup qualifying campaign. Instead, he spoke of a "special night" when around 12,000 Scotland fans attended the 6-0 win over Gibraltar in Faro in their last Euro 2016 qualifier. "I am so proud to be the Scotland manager. It's a great job," he said. "There are disappointments along the way, that's for sure, but it has been a fantastic experience." Scotland finished fourth in Group D, three points behind the Republic of Ireland, who enter a play-off over two legs for a place in France. 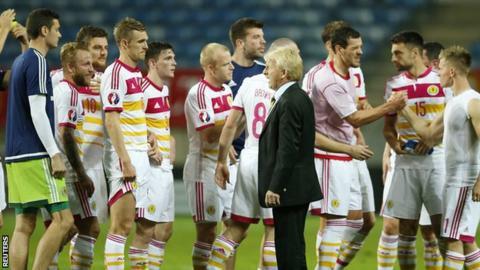 Under 58-year-old Strachan, Scotland have won 12 matches, lost eight and drawn five. Now he must decide if he wishes to continue in the post he took up since January 2013 for the World Cup qualifying campaign against England, Slovakia, Slovenia, Lithuania and Malta. Thousands of Scotland fans journeyed to the Algarve for the match, despite Scotland's 2-2 draw with Poland on Thursday making the match, in effect, meaningless. "They could have turned up because they had already booked and been negative but from the start [it was] their positivity," said an appreciative manager. "The fans, if they see a group of players who try their best, they will support them. That has never been more clear than this evening. "We've seen a special night in terms of the bond between fans and players. The players are buzzing because of the support they got." What next for Scotland and Strachan? Pressed to reveal his intentions, Strachan added that there would be a "debrief" and that he would speak to the Scottish Football Association and his family to discuss his future. "The experience has been far, far better than I thought it could ever be," he said. "It's quite an emotional night. I'm still enjoying the players' performance, I'm still enjoying the fans' performance. I'm going to enjoy that for a bit before I start thinking about me. "I think it is wrong to be talking about me right after a game. "I'm working with a great bunch of players and great staff and it makes my job easy."